The update is early this week because I have surgery in a few days. This will give me a chance to respond to comments before that happens. Our IndieGoGo campaign is sitting at 33% of our goal! A big thanks to everyone who has supported us so far both financially or by passing on the word! We can’t thank you enough for the tremendous support we have been shown so far! If you have time, please visit the campaign and use one of the share tools below the video to “Like” “+1” or “Tweet” the page. Each time you do so it adds to our ‘GoGo’ factor, and gives us a better chance of being featured! We would appreciate it a whole bunch! What’d she say, what’d she say? Love that last panel, the group has really come together now. Also, best of luck to your surgery, hope all goes well! Nice send off. Good page. Excellent exit, Lenna. No epic adventure should ever begin without a cloak flapping dramatically on your way out the door. 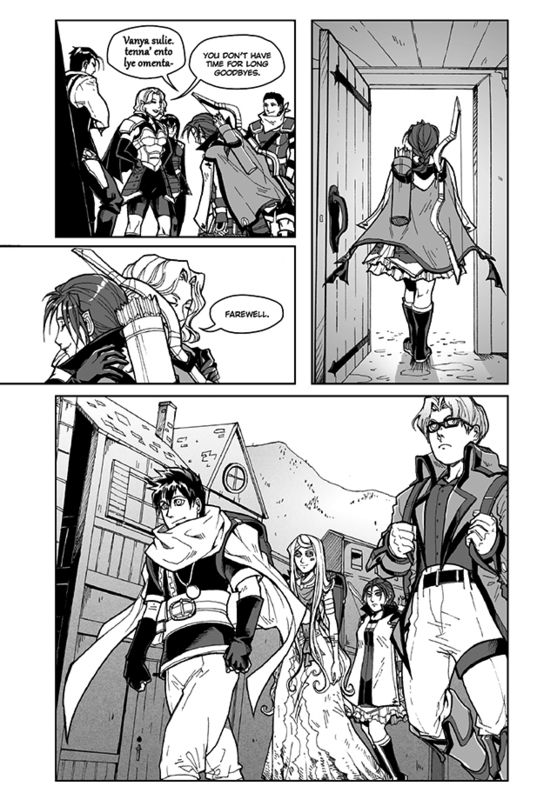 I delight in how Faye, easily the gentlest of the party, is the only one with tattered clothing. Accel and Kaden look appropriately dapper in their adventuring clothes, while Lenna looks battle ready but not battle damaged. I mean, obviously Faye’s dress is made of more delicate material, but she was on the same exploding train as Accel and Vincent, and she battled the shadow monster with Accel and Kaden, yet none of them look worse for wear. Clearly they must have better-quality adventuring apparel. Maybe they should make a quick stop at the local Cabela’s to get that girl outfitted. Just teasing. Anyway, take care and best of luck with the surgery. Stay awesome. And now the party’s even again. YAY! Good luck with the surgery. Poor Fayefaye – she looks rather worse for wear. I do wish someone would reoutfit her if only to make it less easy for her to be noticed. And really curious to see how this group interacts. ALso, wishing you the best on the surgery!